But not all meetings can be full of presents & freebies, though this meeting did have cake AND cookies (score!) and I did go home with some fabric (wicked!) for our charity QuiltCon quilt. (See below.) During October's guild meeting, we got down to business and hashed out... some things that needed hashing out. Our Guild has two separate (and voluntary) bees in progress, with blocks due at the meeting each month. The only real rule is that block patterns must be freebies. Elizabeth Timmons and Michelle Kochan's blocks were first. We love how they turned out! The inaugural event was held in 2014 and it was a hit. This year our Guild will be doing a lottery drawing for interested members who want one of the coveted spots. So much goodness, not enough room! This year it will be held April 23-25th in Lancaster. It's back again this year! 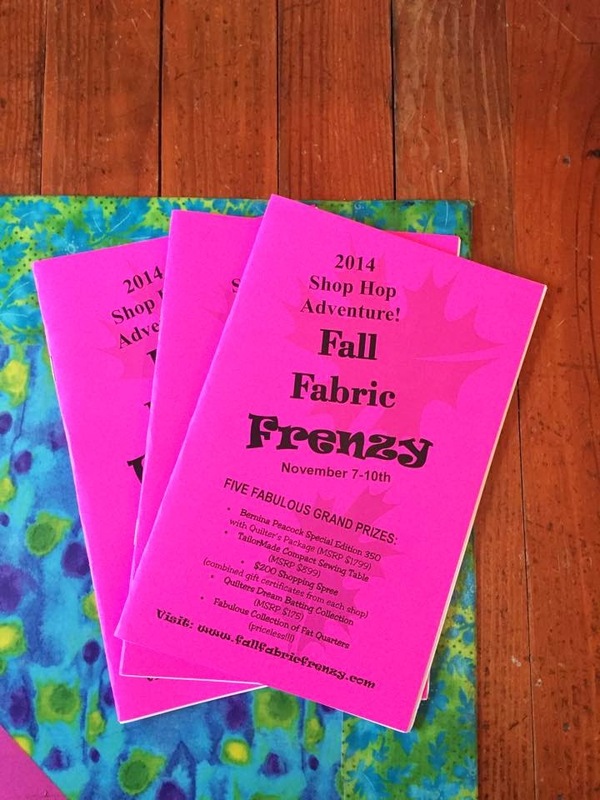 The Fall Fabric Frenzy Shop-Hop is happening November 7-10th. Passports are $5 and can be picked up at any of the participating shops. I popped into The Quilt Block this past weekend (to pick up some Aurifil), and chatted to Cathy Lynch (Byrne Sewing Connection) at our meeting, and the shops are ready for action! Each day during the Shop Hop, each of the seven participating shops will award door prizes to one lucky shopper (28 prizes in all!). If you visit each shop (and get your passport stamped) you'll be in the drawing for some pretty sweet grand prizes. (Are you feeling lucky?) The passports include loads of coupons as well! Support your LQS! (And possibly win some fabulous door prizes in the process.) Quite a few of the Philly MQG members will be hoping from shop to shop over the weekend. As a Guild we decided that we wanted to go for a "liberated block" look for our quilt, inspired by Jackie Gering's style. Many of our members attended her workshop in August and fell in love with her style of quilting. 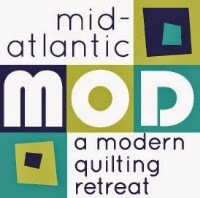 We hope to get the quilt pieced at our Fall retreat in November. Sarah Bond passed out a few prints from to get us all started. A lovely collection from Sarah! This Month's Challenge - Go Minimalist! Pres Andrew says, "make whatever you want and interpret minimalist however you want!" We'll be having a contest and a general show-and-tell session for our minimalist creations. Now the question is, just how minimal are you gonna go? I know I can't wait to see what everyone comes up with! And we mean "show-offs" in the best possible way! Last, but not least, here are some of the quilts that were shared at October's meeting. Want to learn more about who we are and what we do? Check the FAQ!